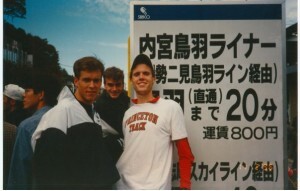 Gjert Ingebrigtsen shares the secret to his sons' success - high mileage - and claims "they don’t have any natural speed. Sam Affolder greatest triple ever at nationals? Any OMAD (one meal a day) people on here? 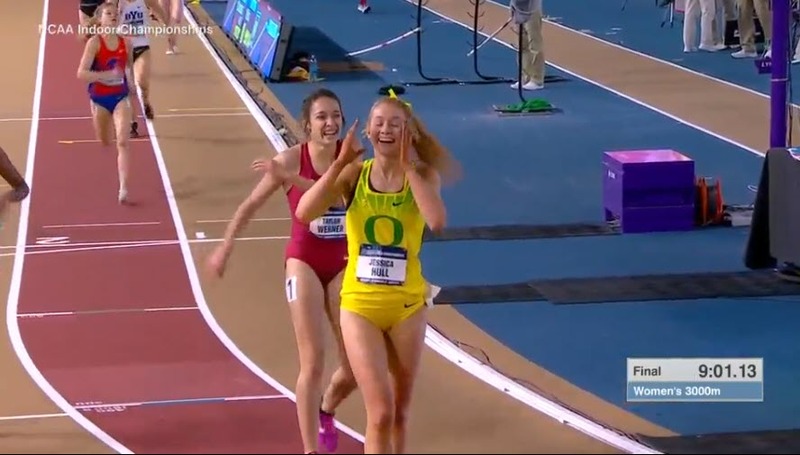 LRC Wisconsin’s Morgan McDonald and Oregon’s Jessica Hull Cross Finish Line 1st Yet Again in 3000s at 2019 NCAA Indoors The men’s race came down to McDonald vs. Fisher as we hoped it would. Monson vs. 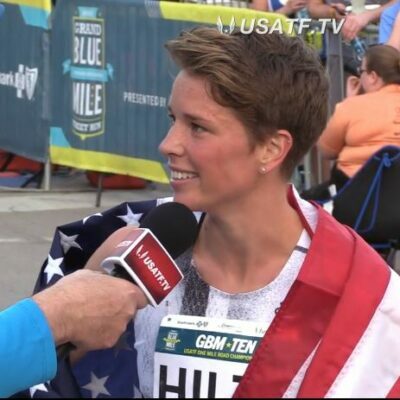 Hull never materialized in the women’s race. LRC Penn State’s Danae Rivers (Narrowly) and Kansas’ Bryce Hoppel (Convincingly) Win 2019 NCAA Indoor 800 Titles Danae Rivers was just 5th coming off the final turn but somehow she got the win over Penn’s Nia Akins at the line. 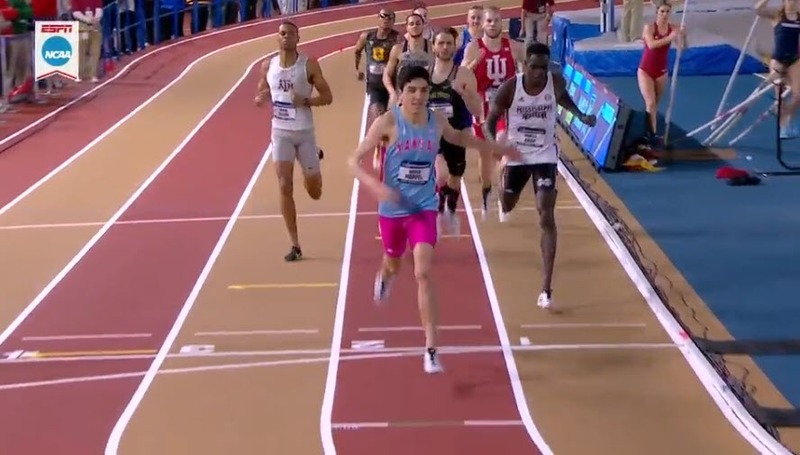 In the men’s race, Kansas’ Bryce Hoppel was clearly the best. 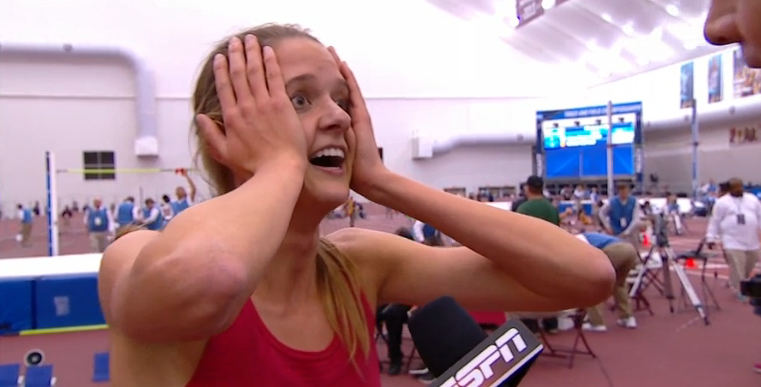 LRC Ohio State’s Julia Rizk and NAU’s Geordie Beamish Pull Off Upsets To Win 2019 NCAA Indoor Mile Titles Two runners who had never even been in an NCAA final before won the mile titles tonight in Birmingham. Men’s winner Geordie Beamish only has a 4:06 pb. MB: Grant Holloway – What level of greatness are we witnessing with this guy? Mo Farah retains Vitality Big Half title in 3-way sprint in 61:15, says he’s confident about London “I’m definitely confident… I’m definitely a better athlete than I was last year in my opinion.” Charlotte Purdue (70:38) also defender her title in the women’s race. Shadrack Kipchirchir and unknown Erika Kemp win USATF 15km title at Gate River Run $12,000 for the winners. 38 Yr Old Helalia Johannes of Namibia runs massive 3:44 pb of 2:22:25 to win Nagoya Marathon as 15 women break 2:27 and 2 national records fall Two time Olympic 5000 champ Meseret Defar improved her pb from 2:27:25 to 2:23:33 to finish 3rd. * Rachel Cliff breaks Canada’s national marathon record with 2:26:56 in Nagoya The old record was 2:28:00 (Lanni Marchant). 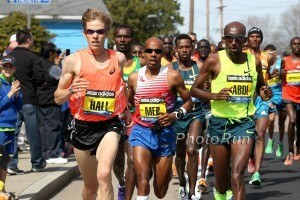 Cliff also has the half NR at 1:10:08. 7 Japanese women beat her in the race. Morocco’s Salah Eddine Bounasr (2:07:52) outkicks two others to win Lake Biwa Marathon as Yuki Kawauchi qualifies for Worlds In his last race as an amateur, Kawauchi ran 2:09:21 which Brett Larner thinks will qualify him for Doha. Adam Hickey British World Cross trials win Hickey last made a GBR world xc team 12 years ago as a junior. 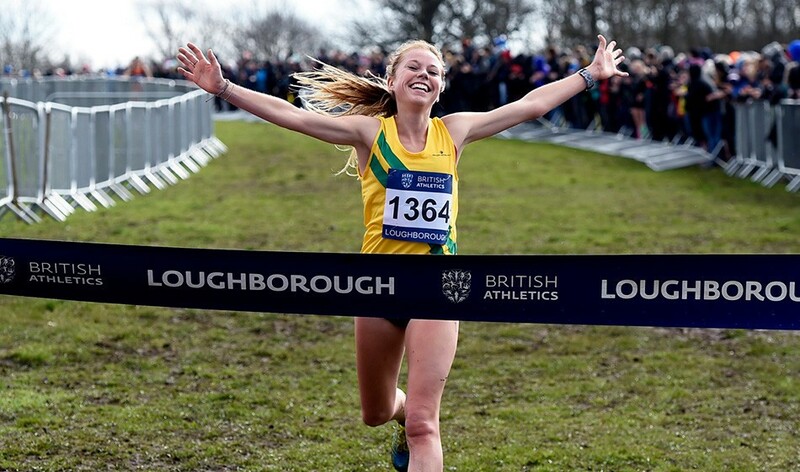 Jenny Nesbitt wins British World XC women’s trials And we also are pleased to report that UK Athletics has confirmed they’ll actually send 4 full teams to Worlds this year. Former NCAA star Kate Avery was 4th. We can’t find full results but think they will show up here. Daniel Rudisha’s father had two very close co-wives The article says David Rudisha’s mother only agreed to marry his father if he also agreed to marry another woman, one of her best friends from childhood. Athletics Canada Names David Bedford Chief Executive Officer No, it’s not the Dave Bedford of London Marathon fame. 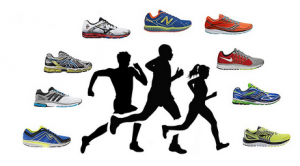 Recommended Read Racewalkers Unite To Save Their Sport The IAAF has proposed two radical changes. 1) Changing 50k and 20k to 30 and 10k and 2) to require all racers to wear a chip that helps determine if they are walking or not. 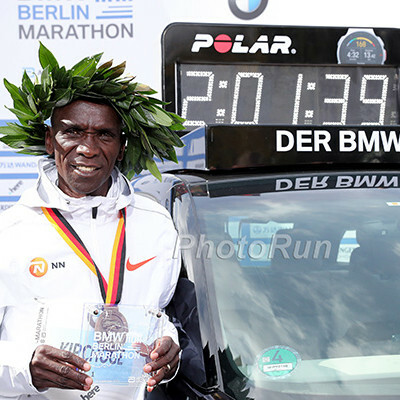 Geoffrey Kamworor Writes A Letter Giving Advice To His Younger Self Some fun facts: Kamworor had to run 8k to and from school each day and used to race with friends and pretend to be either Haile Gebrselassie or Eliud Kipchoge. In Iten, Kenya, The Famed Kamariny Public Training Ground Track Is Closed And Some Big Names Aren’t Happy About It Even Colm O’Connell isn’t pleased about it. 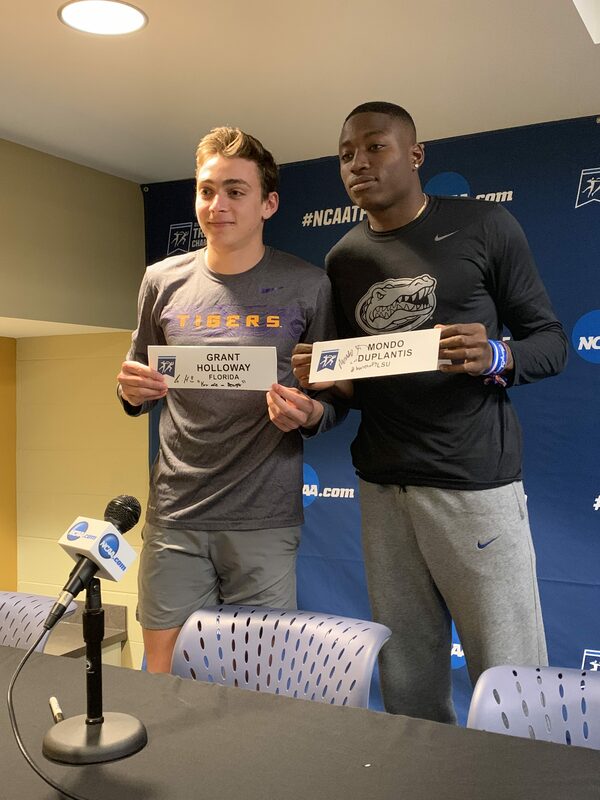 Floridagators.com: UF Repeats as NCAA Men’s Indoor Champs, Win Three Individual Titles Grant Holloway led the way with wins in the 60h (American record of 7.35) and 60 (6.50). Arkansasrazorbacks.com: Lexi Jacobus and Arkansas pole vaulters lead Hogs to their third NCAA title Jacobus racked up the 4th NCAA title of her career as the Arkansas vaulters scored 21. LRC On, Wisconsin! 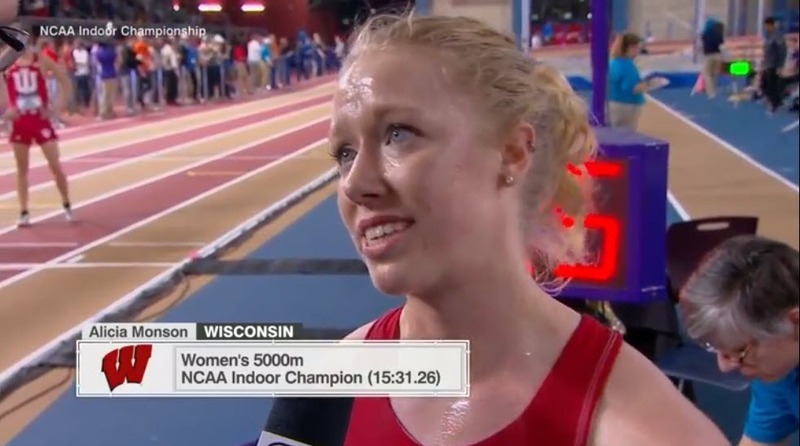 Badgers Morgan McDonald & Alicia Monson Sweep 2019 NCAA 5Ks The only debate we have is which Badger was more dominant? LRC Notre Dame Men And Yared Nuguse Edge Stanford & Grant Fisher (3:54 Anchor) For 2019 NCAA DMR Title; Oregon Women Repeat Iowa State had a massive 6+ second lead heading into the anchor in the men’s race but it didn’t matter as Yared Nuguse got the job done with a 3:56 split. *MB: Grant MF Fisher splits 3:54.24 and loses!!! 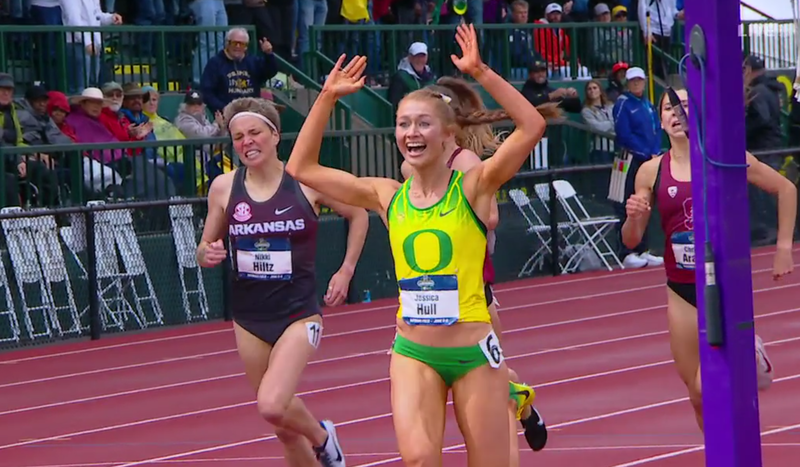 LRC 2019 NCAA Mile Semis: Top 7 Seeds All Move On To Tomorrow’s Mile Final; 800 Semis Produce A Little More Drama Includes post-race interviews with Sam Worley, William Paulson, and Karisa Nelson. Updated with 800 interviews: Danae Rivers, Devin Dixon, and Marco Arop. Florida Gators And Grant Holloway Open Spectacularly Holloway got third in the LJ (7.95m, he was in 1st when he stopped jumping), broke the NCAA meet record in the 60H in the semis (7.44), and had the fastest time of the day in the flat 60 (6.53). North Dakota State Star Payton Otterdahl Is Looking To Be 1st Man To Win SP And Weight Throw At NCAAs Since 2004 He’s halfway there as he won the shot (21.71m, 71-02.75) to become the 1st individual national champ for North Dakota State in any sport. LRC Team Preview: Can Wisconsin Win NCAAs With A Two-Man Team? 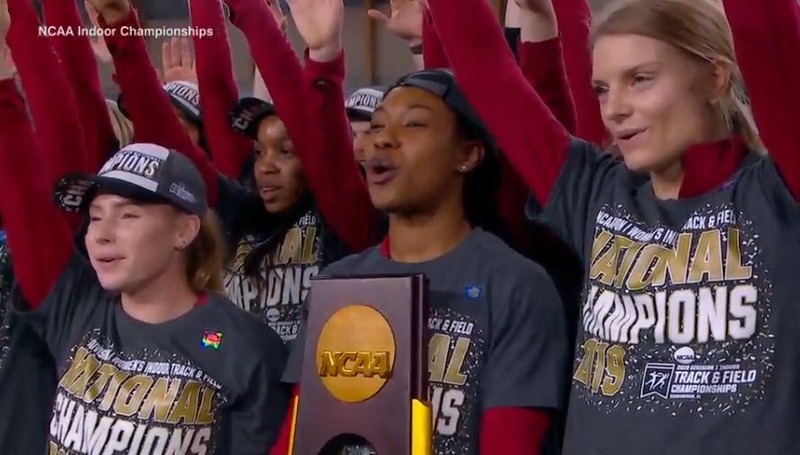 And Can Anyone Stop The Arkansas Women? We don’t think Wisco will win and instead are projecting Texas Tech to win the first NCAA title in any men’s sport in school history. Men’s Pre-NCAA Bowerman Watch List Includes Distance Runners Grant Fisher, Oliver Hoare, And Devin Dixon Freshman pole vault star Mondo Duplantis is also on the list. 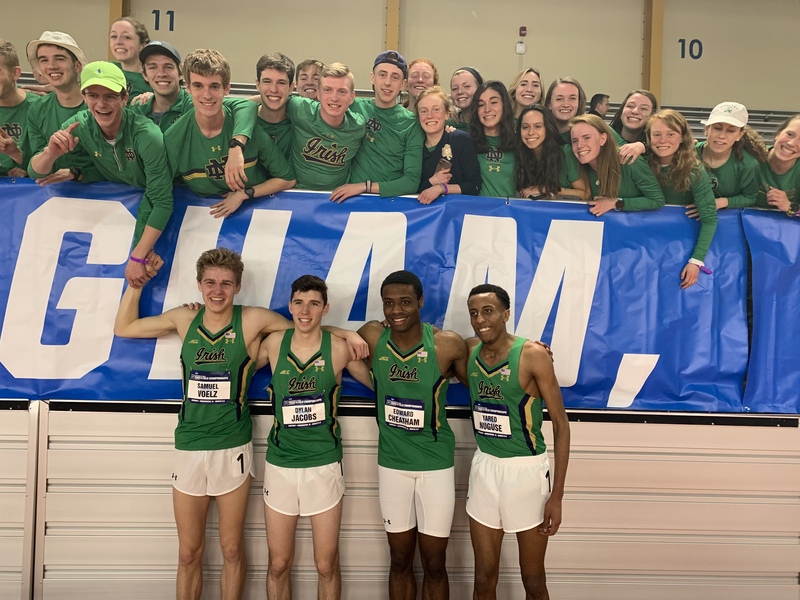 Sam Affolder And Loudoun Valley Break DMR Record (9:54.41); Katelyn Tuohy Leads Team To 4th Straight DMR Win The splits were as follows: Jacob Hunter (3:01), Akere Simms (50.92), Connor Wells (1:55) and Affolder (4:06.21). Tuohy split 4:41. *MB: Sam Affolder greatest triple ever at nationals? Two 4:06 splits and a 1:51. 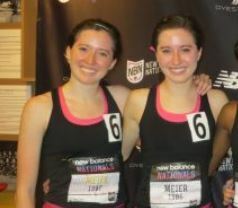 10 Girls Story Lines To Follow At New Balance Nationals Indoor 2019 Naturally, #1 is Athing Mu. 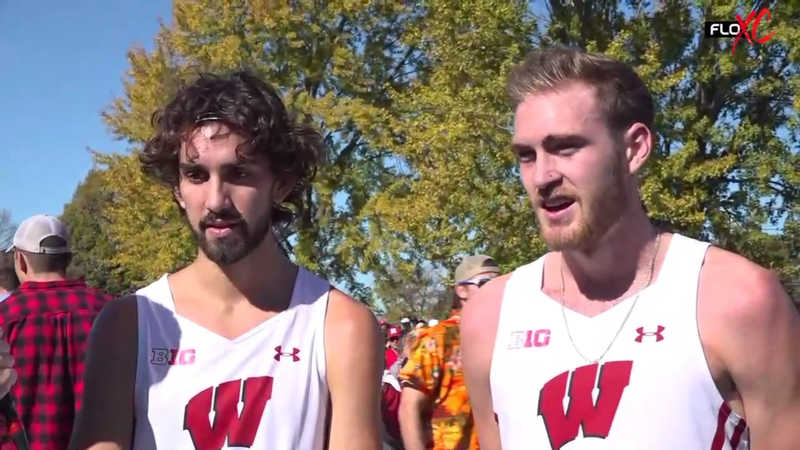 LRC 3k/5K Previews: Can Wisconsin’s Morgan McDonald & Alicia Monson Sweep All Four Distance Races? Or Will Grant Fisher, Jessica Hull, Or Someone Else Play Spoiler? We break down the longest individual races at NCAAs for you. 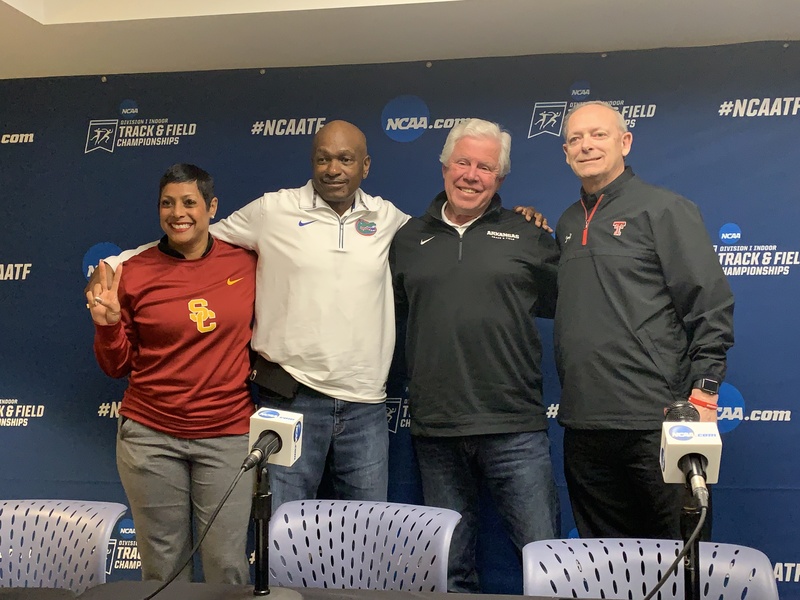 LRC 2019 NCAA DMR Preview: Why Every Men’s Team Won’t Win The DMR (& Why The Oregon Women Will) We break down the DMRs for the upcoming NCAA indoor champs by starting by telling you why each team won’t win. *MB: Rojo claims “several” NCAA footballers can split 46 for 400m in a DMR. Is that true? 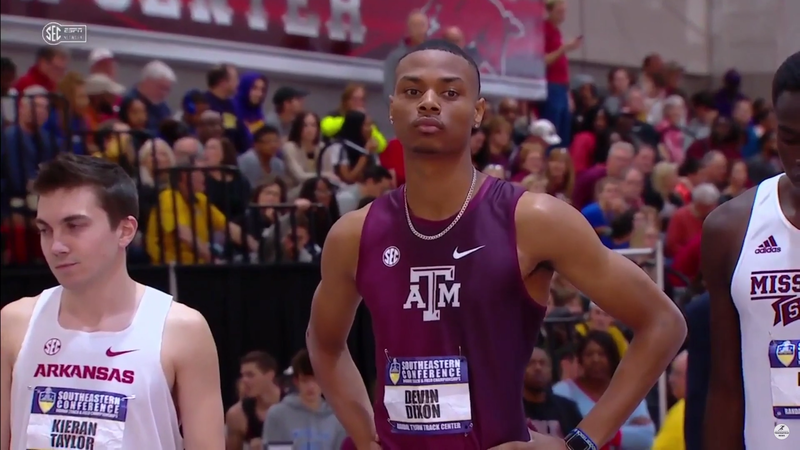 LRC 800 Preview: Devin Dixon & Danae Rivers Try To Cap Stellar Seasons With Their First NCAA Titles We think Texas A&M’s Devin Dixon, who set the American collegiate record of 1:45.27 this year, and NCAA women’s 1,000m record holder, Penn State’s Danae Rivers, will be tough to beat in the 800s at NCAAs. LRC Mile Preview: Ollie Hoare Favored To Win Men’s Title; Can Hannah Meier Complete A Comeback For The Ages In Wide-Open Women’s Race? Prior to this year, Michigan’s sixth-year senior Hannah Meier hadn’t PRed since high school. Yet she enters the NCAA mile as the #1 seed. Can she win it? Up-And-Coming Australian Decathlete Ashley Moloney Is Being Compared To WR Holder Kevin Mayer Who knows how he’ll progress, but 18-year-old World U20 champ Moloney is actually better than Mayer was at the same age. IAAF Inside Athletics Podcast With Lolo Jones Jones talks about some of her experiences from the summer and winter Olympics. 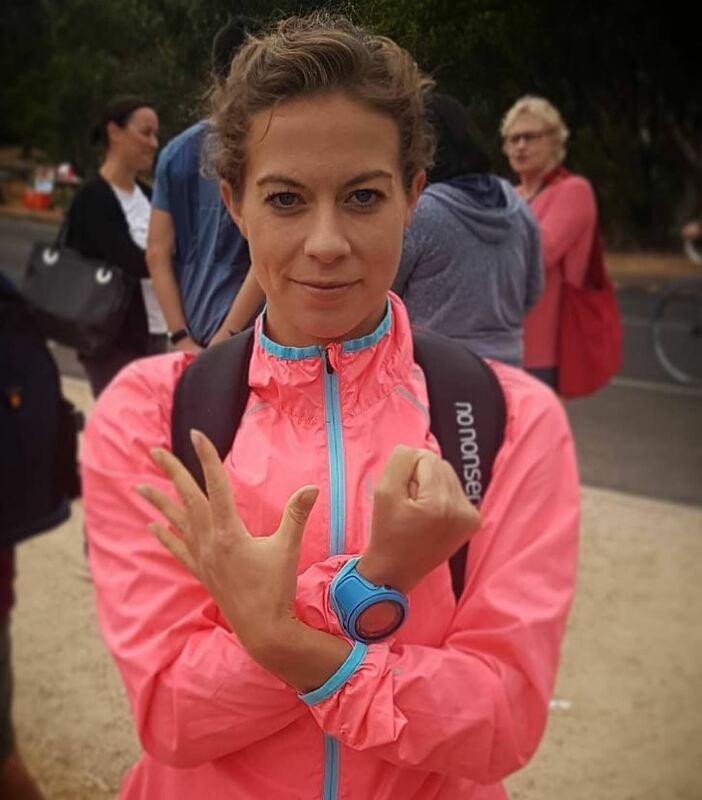 LRC Podcast Kejelcha Is King, Gregorek Joins Sub-3:50 Club, 2019 Euro Indoors, Tokyo, Wife Audio, Transgender Sport And “Scalping” We’ve got a big show for you this week which includes audio from Wejo’s wife as she watches the Tokyo marathon. LRC WTW: Racing And Time Trialing Are Very Different, Laura Muir Is Dominant, And The Olympic Marathon Trials Will Be Hilly If you thought Kejelcha’s world record was all that happened last week, think again. 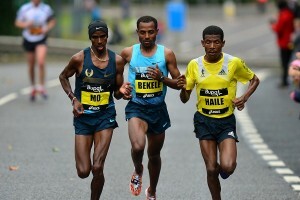 LRC Final Yomif Kejelcha 3:47.01 Mile World Record! As Johnny Gregorek Is Seventh American To Go Sub-3:50 What a race! 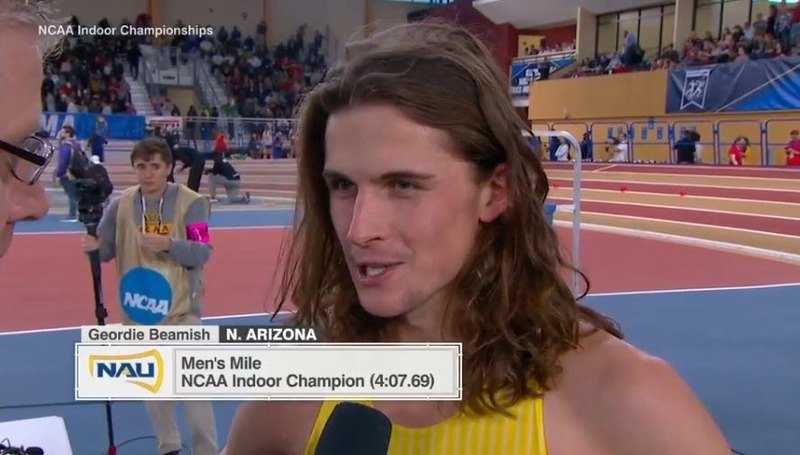 *CAN GREGOREK TAKE DOWN THE INDOOR MILE AR?